This retreat is a wonderful opportunity to recharge your body and calm your mind with an energizing week of Fitness Pilates in Italy. Join Cherie, an expert and experienced teacher, at Villa Bergolo - a beautiful, mountainous, and peaceful environment. You will also explore the rejuvenating effects of nourishing cuisine made from fresh, locally sourced ingredients. Neat Retreats' base in Blangera, a localita of the Bergolo Comune, is an oasis of tranquillity where you can experience an unforgettable retreat, wander through the surrounding woods, and sample the local authentic Italian culture. During the retreat, you will be staying at Villa Bergolo, a recently renovated hilltop farmhouse with spectacular views of a typical Piedmont landscape. More than a century old, it has been elegantly restored to include all modern day essentials, a swimming pool, terraces, and elevated decking from where you can watch the sun rises and sets. The villa was formerly a home for one of the many hazelnut plantations in the area with acres of sloping, wooded grounds. The surrounding area is characterized by vineyards and narrow winding roads, which deliver a breathtaking scenery around every corner. It is also famed for its medieval castles, wines, cheeses, gourmet foods, truffles, and, of course, hazelnuts. The villa has six large double rooms which can be set up as private or shared rooms. Gently wake up with a freshly made lemon tea to prepare you for your morning class. This will be followed by a beautiful and nourishing breakfast. Then, it is 'your time' to read a book, relax by the pool, explore the locality, stroll to the village, or participate in one of the optional activities. Lunch will be prepared and served during this period. Let go, immerse yourself, and forget the time. Neat Retreats will make sure you are back in time to enjoy your evening class, followed by a delicious dinner and more relaxation at the beautiful Villa Bergolo. Fitness Pilates is a more modern approach to the traditional form. However, its aim is the same - to help identify basic postural imbalances through Pilates-based exercises, targeting deep postural muscles of the body, building strength from the inside out. The result is a properly realigned spine and a body that is at less risk of injury and at peace. Classes will be given by a highly experienced teacher, Cherie, on an elevated platform which gives way to breathtaking mountainous views. Cherie will share with you her passion and knowledge, as well as supporting and encouraging you over your wellbeing journey with Neat Retreats. This Pilates retreat is open to individuals at all levels. Since the group is small (maximum of 12 participants), Cherie will be available for individual attention and advice. By using her dance choreography skills and experience, she has added her own unique twist to the sessions. As a result, you will feel like you are dancing your way through your fitness Pilates sessions. While the kitchen and lounge are the heart of the home, you can relax by, or in, the swimming pool, read a book or grab some downtime in the shade, and listen to the wildlife chorus. Meander to the beautiful old village of Bergolo where you can eat, drink, and watch the world slowly go by. You can also enjoy any of the daily, optional activities such as a guided mountain hike, wine tasting, and visiting Alba market. On this retreat, you will get plenty of opportunities to explore and immerse yourself in the beautiful surroundings of Villa Bergolo. Cherie started dancing at the tender age of eight. Since then, she has always used music and movement to help free the mind, body, and soul. She danced professionally for 14 years before trading in her dancing shoes for trainers and has been a fitness professional for the past 15 years. During that time, she has helped hundreds of men, women, and children become fitter, healthier, and happier. Her dance background has always played a major role in her fitness coaching. Even more so, her ballet tuition stood her in good stead when training and qualifying as a fitness Pilates instructor. Villa Bergolo in Blangera, a localita of the Bergolo Comune, Italy, is located about 70 miles southeast of Turin and about 60 miles northwest of Genoa. Indulge in a range of nourishing, scrumptious vegetarian meals from the freshest local produce while on this retreat. You will be surprised how the simplest of ingredients can taste so yummy when combined and prepared with love and know-how. The food, where possible, is sourced locally, grown and prepared in an environmentally friendly way. The talented cooks will spoil you with a variety of delicious and richly nutritious meals leaving you wanting seconds and feeling great. 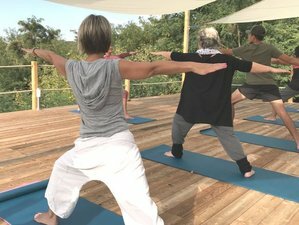 Neat Retreats is an exciting venture offering neat, high-end yoga and Pilates retreats in Italy.